The MB Pro 2 UC ML Bluetooth Headset from Sennheiser connects wirelessly to your devices so you can conduct conversions with optimal sound quality. It pairs to your Bluetooth-enabled smartphone, notebook, or desktop and includes a USB dongle for systems without this technology. When used with an iPhone, you can see the remaining battery power on your phone. Sennheiser has designed this headset with two earpieces that surround you in stereo sound. These earpieces provide you with clear and natural audio on calls and come with large comfortable leatherette pads. Aside from the earpieces, it features a microphone that sports a single-channel noise reduction system, which reduces background noises coming from a car, air conditioner, or fan. 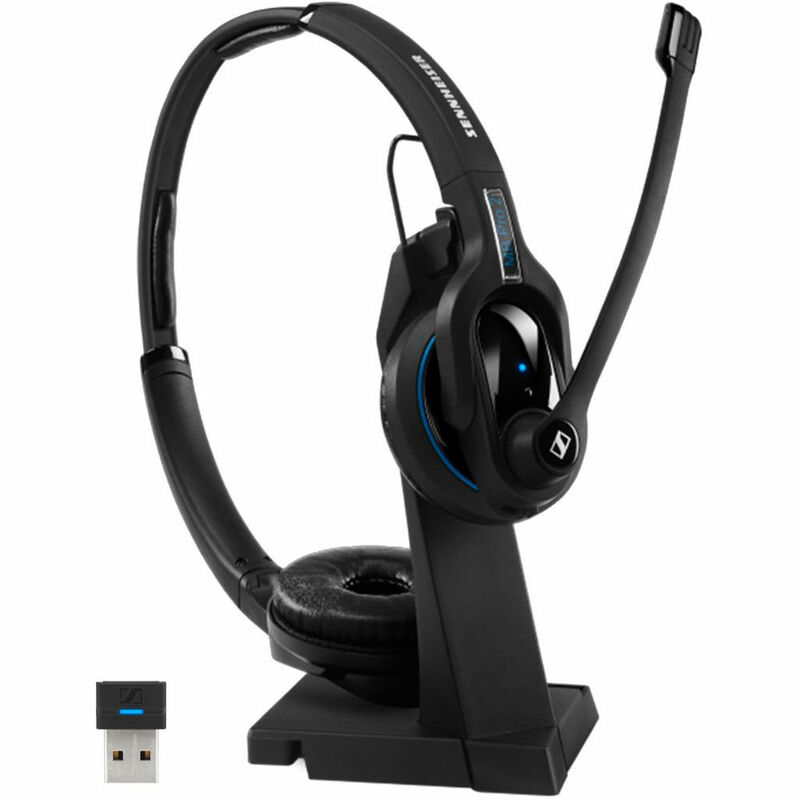 In addition, the MB Pro 2 UC ML headset offers up to 15 hours of talk time and is optimized for Skype for Business. This headset is equipped with HD sound to ensure a clear and more natural audio experience. The Room Experience Technology reduces listener's fatigue for all day users. This technology gives you the impression that you are having a conversation with a person in the same room, by externalizing the sound from your head. It is designed to provide business professionals the flexibility and mobility to communicate in the offices and on the move. Intuitive answer/end feature enables you to answer and end a call directly, without further call management. This feature manages PC and mobile phone calls from a single headset for maximum call handling flexibility. MB Pro delivers up to 15 hours call time between charges and freedom to move up to 82 feet from the audio source, depending on device and environment. The iPhone battery meter keeps the user aware of available talk time. This feature keeps you updated on various functions, such as power-on and pairing status. MB Pro comes with large leatherette ear pads for a comfort fit and all day wearing comfort. ActiveGard hearing protection technology protects users from the potential danger of acoustic shock from unexpected and sudden sound bursts on the line. Sennheiser BTD 800 Bluetooth Mini-USB adapter can stay in your laptop or desktop port. The headset charger stand provided with the headset gives users easy magnetic charging and a space-saving design. By placing the headset on or off the charger stand, the user is able to answer and end a call directly without further call management. Box Dimensions (LxWxH) 8.11 x 6.693 x 3.228"
MB Pro 2 UC ML Bluetooth Headset is rated 5.0 out of 5 by 2. Rated 5 out of 5 by Anonymous from Works as advertised The noise canceling microphone works really well. Rated 5 out of 5 by Edgar from Fantastic headset This is the perfect headset for people who spend lot of time in the phone. I started using it 3 weeks ago and no complains, voice quality is good and noise cancelling also works great. It works perfectly with microsoft lync:skype for business. Charging base is not very functional if you need to move it from home to the office.